Cooler weather is finally headed our way and these custom travel photo mugs are perfect for carrying warm drinks on the go! 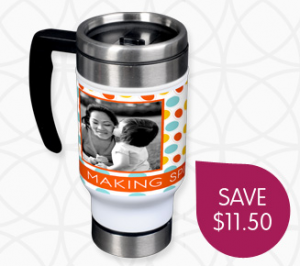 The price on this InkGarden custom travel photo mug has dropped to just $2! These are normally $14.99, so this is an awesome deal! These make great gifts, too and Christmas is just around the corner! They’re great for teachers and parents on the go, too! 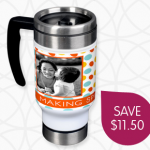 There are over 300 designs to choose from or you can design your own mug with your own logo and text. 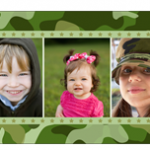 This is great if you have your own business and want to show off your logo! 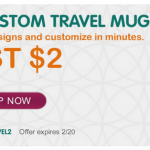 Make sure you enter the code TMUG2 at check-out to get the discounted price! 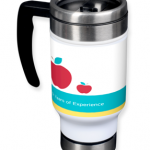 These apple mugs would be a great holiday gifts for your child’s teacher! 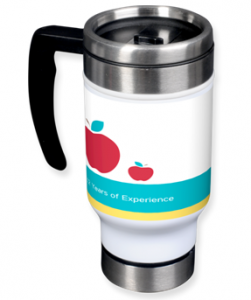 Personalize it with their teacher’s name! Fill it with chocolate for even more brownie points! Who doesn’t love chocolate?! You can also throw in a gift card. Shipping and handling fees do apply. It was $5.99 for me. InkGarden: 12 personalized note cards for just $2! 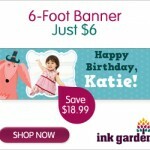 InkGarden: 6 foot banner only $11.99 shipped!